As physios and Pilates instructors we spend a lot of time analysing and discussing posture, especially with regards to the back, but your foot posture is equally as important. In order to have a good stable base of support and alignment of the lower limb good foot posture and alignment is essential. It is one of the fundamental basic areas that we concentrate on in Pilates and often in our warm ups we focus a lot on our foot posture, specifically our foot series exercises. We don’t do all those heal raises and single leg dips for nothing you know! We are very lucky at Physio Plus to have Alistair Dall our resident Podiatrist from Sports Podiatry Scotland working along side us. Physiotherapy and Podiatry can really complement each other and a combined approach can really help in combating lower limb issues. Both as physios and Pilates instructors we often get asked a lot about pronated or flat footed postures, so who better to listen to than the expert! Having shared a quick case study of a patient of mine on Facebook recently who was suffering from a painful flat foot deformity I thought it would be good to give a little more information about this condition as it is something I regularly treat in clinic. The patient was a 64 year old male who came into the clinic complaining of pain affecting the inside of his left ankle. He reported no history of trauma however he did report that he had always had quite flat feet but that they had never troubled him before. He rated the pain as a very significant 7/10 and as he was a very keen golfer, was worried that he wouldn’t manage to play golf again. He was suffering from a condition known as Posterior Tibial Tendon Dysfunction (PTTD for short). This is a painful condition that causes progressive flattening of the arch of the foot. It occurs when the Tibialis Posterior tendon becomes insufficient and fails to support the arch. As in this case there is often no trauma involved and it is most commonly caused by gradual wear and tear to the tendon. As the arch flattens there is more stress and strain placed on the tendon and the ligaments in the arch of the foot. Patients will often complain of pain around the inside of the ankle or in the arch of the foot, they may also have noticed a change to the shape of their foot. They will often comment that walking long distances or coping with uneven ground is difficult and also that they have ‘lost the spring in their step’. In more advanced cases they may also complain of pain at the outside of the ankle due to impingement. Diagnosis is generally made clinically by the combination of symptoms and physical examination; however sometimes a scan is neccessary. Treatment depends very much on the patients symptoms, degree of deformity and whether or not there is any arthritis present. In the early stages of the condition, specially designed insoles (orthoses) are very successful. 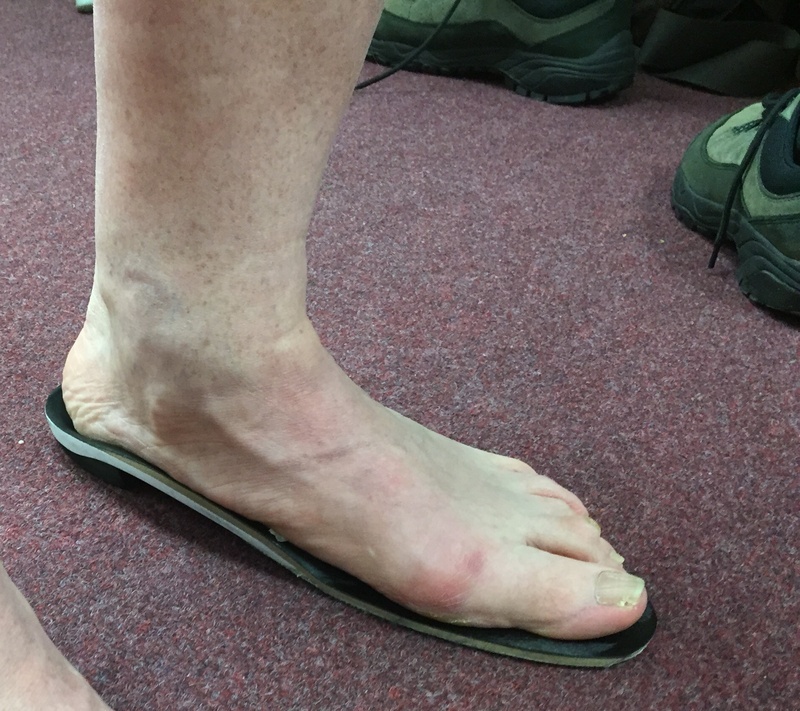 In this case a pair of custom orthoses were designed and manufactured to reduce the stress of the painful tendon, allowing it to heal and become pain free. Once the tendon was asyptomatic a course of strengthening exercises were prescribed to allow the tendon to better cope with the stresses and strains that are placed upon it. 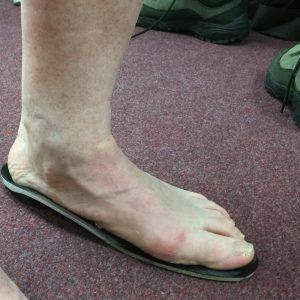 Without treatment this can become a very painful and debilitating condition and in the more advanced cases it may be neccessary to either utilise a specialist ankle/foot orthotic called a Ritchie brace or to refer for surgery (more about that in a further blog post). As with any condition the longer it is left untreated the harder it is to resolve. I’d like to say a huge thank-you to this patient for allowing me to discuss his case with you and share his photos.